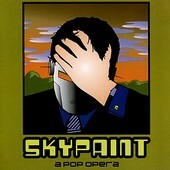 Though it may be A Pop Opera, Skypaint's A Pop Opera is lacking one thing: pop. Or, at least good pop. The songs on A Pop Opera are lacking hooks, good singing, and generally everything that makes pop songs so infectious. Not one track here will make you sing along. You'll put it on, cringe, and wonder how this is a pop opera when there isn't a decent pop hook to be found. I'll give it a D.